I've become interested in foundation pens. Years ago, as a kid, I used a foundation pen, and I played around with calligraphy using a foundation pen with a calligraphy nib. So this is a renewed interest. Pilot Metropolitan, violet leopard with a fine nib. This is a great pen. It was inexpensive, and yet it writes very smoothly - flows across the paper. It comes with a converter and a cartridge so that you can choose which method of adding ink you prefer. I started with a cartridge and then switched to a converter to use bottled ink. Platinum Plaisir, green with a fine nib. I like this pen, too. It doesn't write as smoothly as the Metropolitan, but it still does a good job. When I purchased it, I also purchased a converter (which doesn't come with this pen. Parker Vector 88. This isn't my pen. It belonged to my husband's grandmother. He bought it for her as a gift, and when she died, it was returned to him. When he saw my interest in these pens, he dug it out for me to use. It still had the cartridge in it that she had used, although it was empty of ink (or dried up). I worried that the dried ink would have ruined the feed or the nib, but cleaning it was rather easy, and it was restored. No one has used it for about 20 years, and now it's working just great. I purchased a Parker converter for it. Blue-Black Pilot cartridge - this worked as expected, but I wanted to try something a little bit brighter. Diamine emerald - It's a nice green ink, but it leans more toward yellow green than bluer green. Noodler's Green Marine - I like this one better than the Diamine Emerald because it is a bluer green. Personal preference. 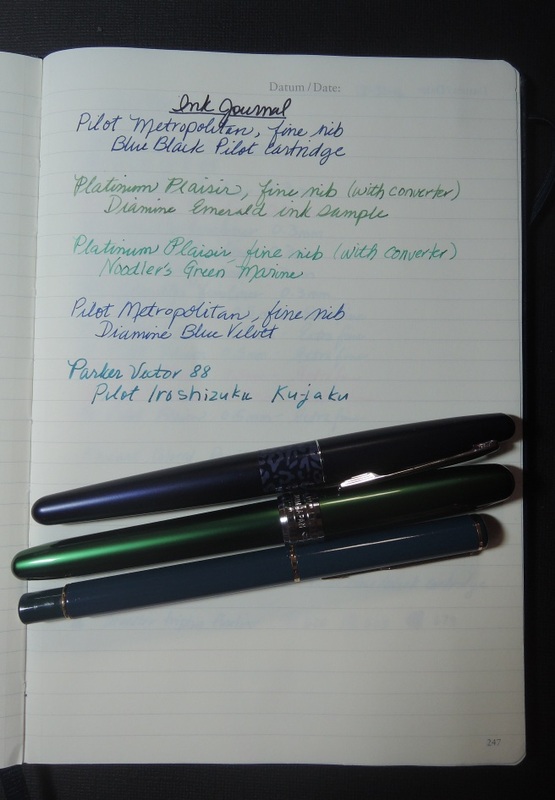 Pilot Iroshizuku Ku-jaku - a deep teal blue-green ink - peacock. This is the ink I put in the Parker 88. You'll see that for most of the inks above I've linked to samples from The Goulet Pen Company. They have a nice option that offers small samples of bottled ink to try. Great idea - and it has allowed me to try several before I buy a whole bottle. The Iroshizuku link listed above was a "surprise" ink. It's another option they offer - you can purchase a randomly selected sample of ink. Fun idea! For those interested in finding more out above fountain pens, I recommend The Goulet Pen company Youtube page. It's what drew me into to exploring this world again. FYI - the notebook above is a Leuchtturm 1917 journal that I use for Bullet Journaling. In October of last year, Steve and I traveled to Portland, Maine, for a NAUMF meeting. It was a great trip! While we were there, we visited a yarn shop called KnitWit. 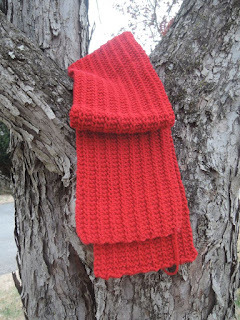 I like to purchase "souvenir" yarn when we travel - yarn that I can knit into a finished object (usually a scarf) and when I look at it, I remember the trip. I bought three skeins of Lark yarn from Quince & Co. in the colorway Peaks Ferry (which is red). 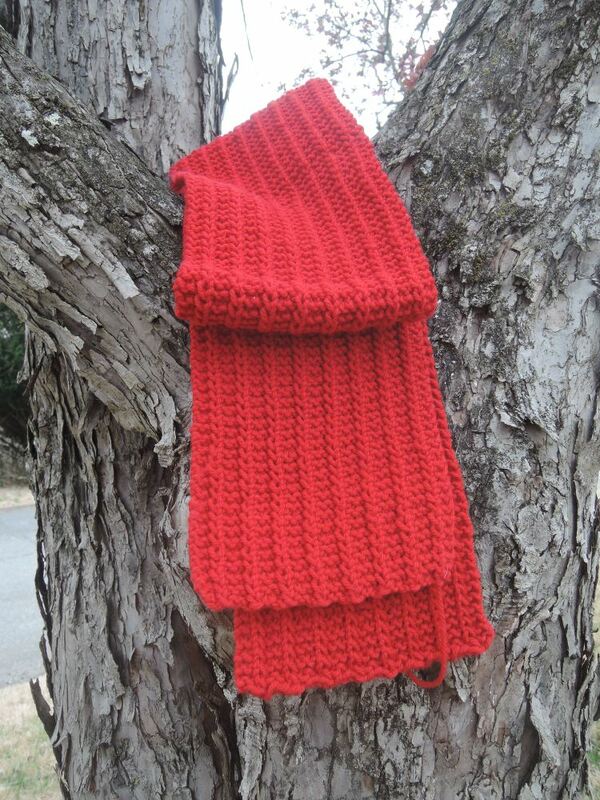 Since then, I have knit it into a scarf. I love blue yarn, but I steered myself away from it on this trip, just to have something different. As I was checking out, the very nice clerk said that this would remind me of lobsters - very true! See, souvenir yarn. And we did go to a Lobster Bake while we were there. Pattern - Yarn Harlot's one row scarf pattern - one of my very favorites. 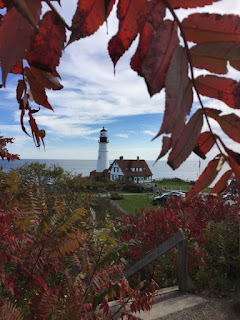 The image of Portland Head Lighthouse was taken with my Nikon CoolPix P330. I left the "big" camera at home, so all of my Maine pictures were taken with my CoolPix or my iPhone camera. I was playing around with color earlier in the week. The first image is from Penny Black - called Poppy Time. It's a rubber stamp (not a clear stamp), and, I have to say, it's one of my favorites. I use it all the time. 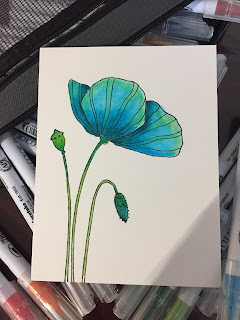 I stamped it on Strathmore Bristol paper and then colored the image with Zig Clean Color Real Brush markers. I haven't had a lot of luck with them, but this time, it all seemed to work. 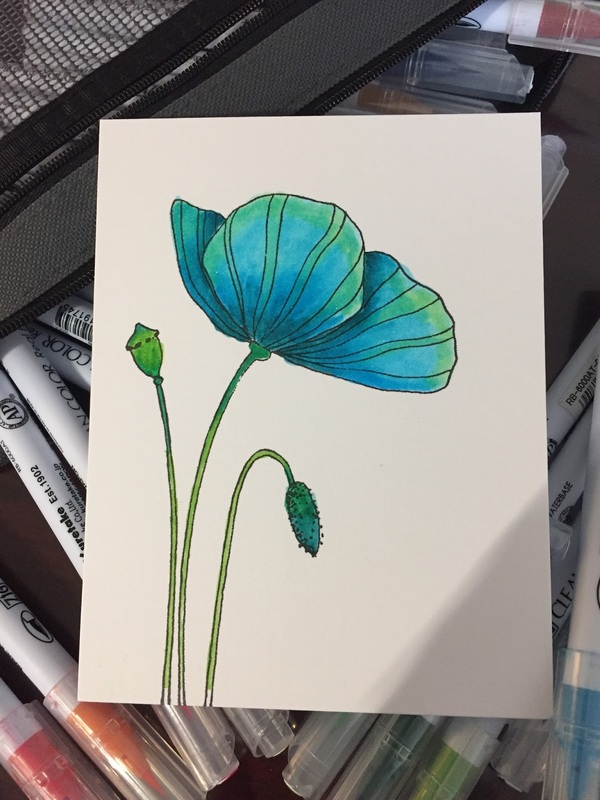 I often color this card with reds or orange-reds (like a poppy), but this time, I used teals, aquas and green. I really like the effect. The second image is from the set of pre-printed images called Full Bloom, drawn by Suzy Plantamura on Tim Holtz watercolor paper. The set is from the New Beginnings release at Simon Says stamp. 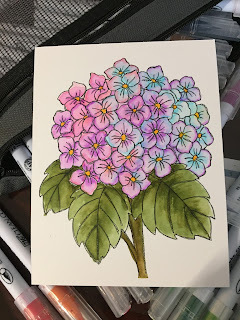 This is also colored with the zig real brush markers. I like the pre-printed images - although they make me nervous. With a stamp, I can always re-stamp if I make a mistake. Not with these. One shot. That aside, I like them, and I like the convenience of grabbing them and taking them to color outside of my studio. These are all great flowers. I look forward to coloring them. I've already turned both of these into cards. I mounted the top one a narrow black mat and then on Tropical Teal (MFT) card base. I added some glimmer with a Spectrum Noir sparkle pen and a few blue and green glimmery sequins. I white heat embossed Happy Birthday on black card stock (narrow strip) and backed that with a black and white stripe washi tape. I trimmed the hydrangea, and mounted it on lavender and light blue cardstock. I added three clear droplets from Pretty Pink Posh. This one has no outside sentiment, but became a get well card.